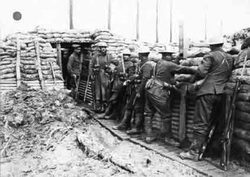 World War I was mainly characterzed by trench warfare. The middle part of the war, 1916 and 1917, was characterized by continued trench warfare in both the east and the west (Spartacus). These trenches were long, deep rows of ditches dug in the ground, in which they slept, ate and fought against the enemy. Soldiers fought from dug-in positions, striking at each other with machine guns, heavy artillery, and chemical weapons. Though soldiers died by the millions in brutal conditions, neither side had any substantive success or gained any advantage. By the war's end, each side had dug at least 12,000 miles of trenches. Both sides quickly recognized that assaults against the enemy trenches were suicide if begun in broad daylight, so attacks tended to take place just before dawn or right at dawn (Spartacus). Poison gases tended to be more effective in the mornings, as the colder air and absence of wind allowed the gases to stay closer to the ground for longer periods of time. Except for artillery shelling, daytime was relatively safe for the soldiers on the front line. Once the sun went down, men crawled out of their trenches to conduct raids, investigate the layout of the terrain, and eavesdrop near the enemy lines to pick up information on their strengths, weakness and strategies.The Allies used four "types" of trenches. The first, the front-line trench (or firing-and-attack trench), was located from 50 yards to 1 mile from the German's front trench. Several hundred yards behind the front-line trench was the support trench, with men and supplies that could immediately assist those on the front line. The reserve trench was dug several hundred yards further back and contained men and supplies that were available in emergencies should the first trenches be overrun (Spartacus). Connecting these trenches were communication trenches, which allowed movement of messages, supplies, and men among the trenches. Some underground networks connected gun emplacements and bunkers with the communication trenches. German trench life was much different. They constructed elaborate and sophisticated tunnel and trench structures, sometimes with living quarters more than 50 feet below the surface. These trenches had electricity, beds, toilets and other niceties of life that contrasted sharply with the open-air trenches of the Allies.